BE:How did you come up with the name MagNUm are you a fan of Tom Selleck, Or hand weaponry, and did you know there was a wrestler named Magnum TA. How did the name come about? MAGNUM: (Laughs) I’m afraid my answer wouldn’t be a family friendly response. My old ring name was Magnum X.L. Since I’ve stopped competing in the ring, I’ve tried to go by my real name, John, but Magnum seems to be sticking. Of course I’ve heard of Magnum T.A. and I had the pleasure of meeting him once. Nice guy, it’s a shame his career ended way before it should’ve. BE:Who do you believe are the most talented wrestlers on the independent and national circuit. Is there anyone overrated? MAGNUM: On the independent circuit I’ve got to see some amazing talent. From the bigger name guys like Ricochet and Chris Hero to guys that are on the rise in Alexander Hammerstone and Monster Factory tag team A.C. Roc and many others. On a national scale Cesaro, Daniel Bryan, all former members of The Shield & The Wyatts are awesome. I don’t really feel like there’s many overrated wrestlers as I believe one’s spot on a card is more fitting than years ago. BE:What is the worst thing a fan ever said or did to you and did you ever pay them back. MAGNUM: I can say I never had anything thrown at me or anything real mean over the top said to me. There was a time when I was hammering away at an opponent and a fan yield “Magnum X.L. is an 8 year old on steroids.” As a heel when I heard that, I couldn’t help but to stop and laugh and it was maybe the only time I broke character. It really doesn’t count as a “Worst Thing Said” but it was one that got me off guard. BE:What is the hardest part about being a referee? Do you sometimes sneak in a cheap shot when they are not following the rules? 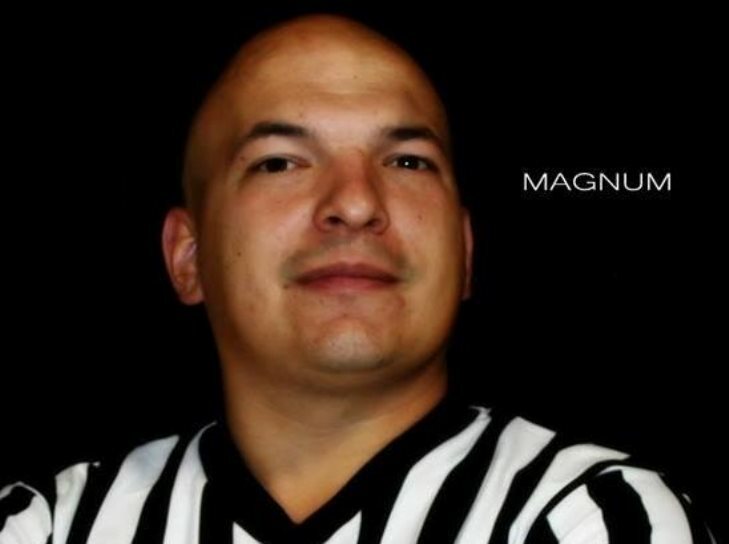 MAGNUM: The hardest part about being a referee, is not letting my old character as a wrestler come out. I’m pretty quick witted and when a fan yells at me, it’s hard to not reply. I’ve never had a real altercation with a wrestler for not following the rules of wrestling, but I am sure I can set them straight if they get too out of hand. BE:What do you feel about the current state of wrestling is it booming again or are there tough times ahead. MAGNUM: I feel like right now we are in the middle of tough times. The ratings aren’t what they used to be. I think the only way to go from here, is up. Will pro wrestling ever have ratings in the 5.0 range again? We can only hope so. I’m a fan with what the WWE has done with the performance center and NXT. There are too many indy “promoters” & “wrestlers” that book themselves in the main event and get the belt as well. Some even pay to be on bigger Indy card shows or pay to bring in big name talent and they wrestle them as well. That’s bad for the industry. The performance center is the right way and the future of this business. BE:What are your future plans in the industry are you in it for life or will you be pursuing some other form of entertainment? MAGNUM: I feel like I’ll always be involved with pro wrestling in one way, shape or form for as long as I’m alive. I have auditioned for variety of things from an Oscar Mayer Wiener commercial to The Sopranos, WWE Tough Enough and a few other gigs, but never got the call back. One thing I’ve learned is no matter how many times you get knocked down, you have to get up and try again. ← Previous Story He’s No Bundy – Colt is a Shooting Star!